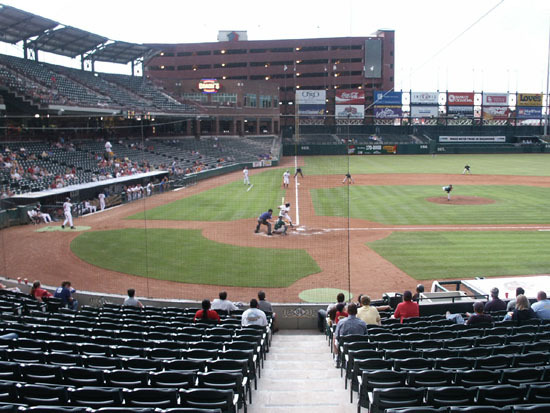 The Oklahoma RedHawks, a Triple A affiliate of Texas play at SBC Bricktown Ballpark, "The Brick" was built in 1998 seating 13,066. 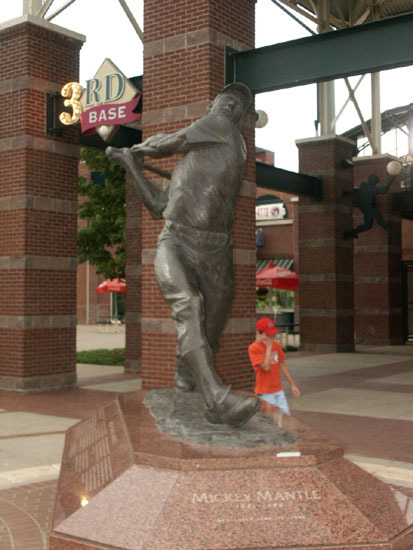 At the homeplate entrance there is a statue of Johnny Bench and at the third base entrance one of Mickey Mantle. Both were native Oklahomans. 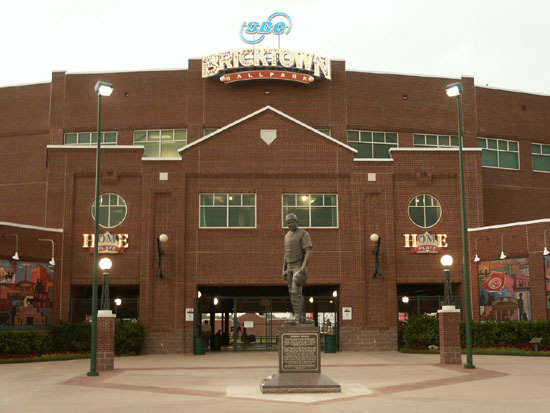 There are large tile murals showing different parts of the old Bricktown area on both sides of the home plate entrance. 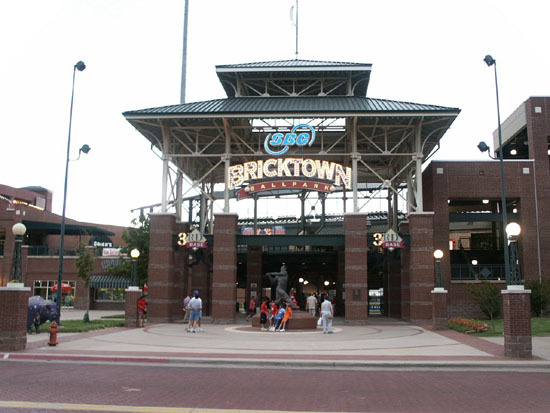 The Bricktown area looks like an old warehouse district being converted to an entertainment area. 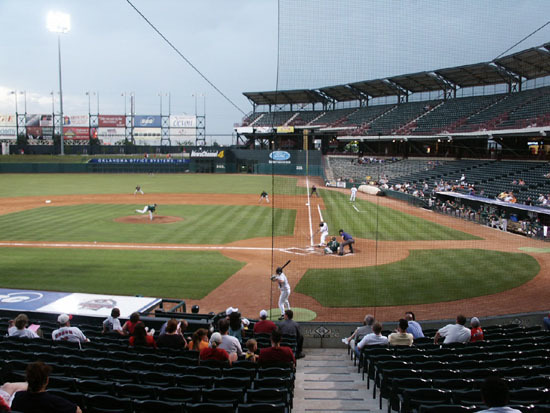 The ballpark has two levels of seating with two levels of suites at the back of the second level of seats. 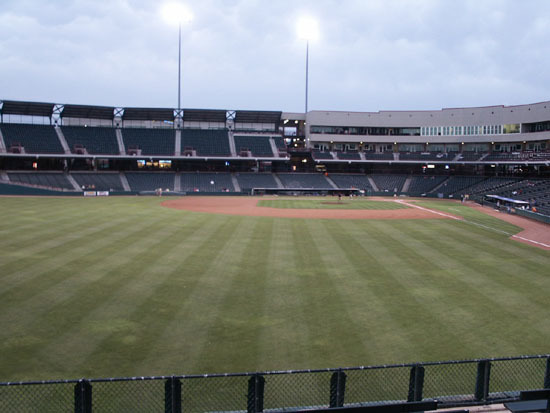 There are backed bleachers at the baseline corners and in left field, all general admission. 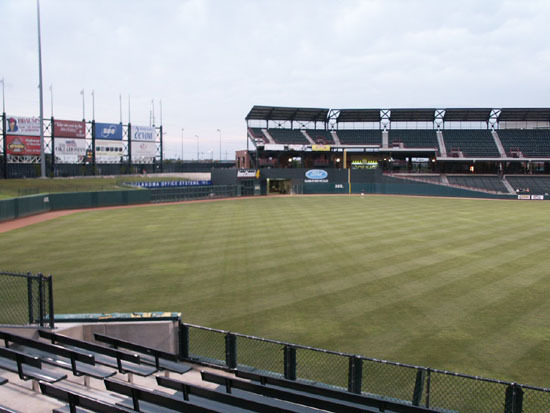 Lawn seating is available in left center, right center and right field. You can buy a season pass for grass seating for $49. This is the first time we have seen this option. There is a wide concourse under cover of the second level and you can walk all the way around the field. 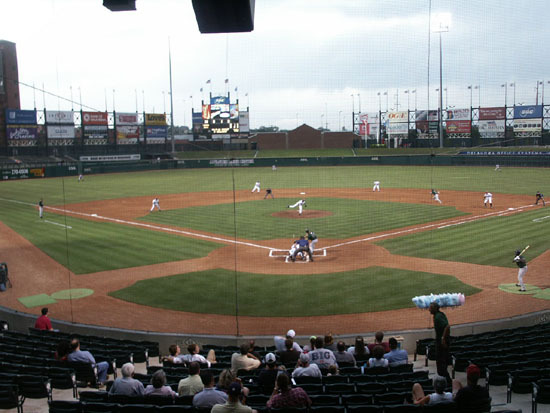 There is a brick wall in the batter's eye behind a grass berm which is the back of a concession stand. 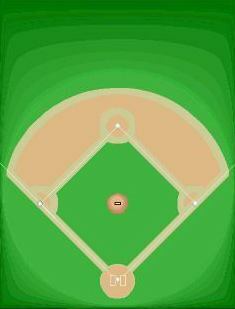 Coach's Restaurant is on the second level behind the bleachers at the end of the third baseline. 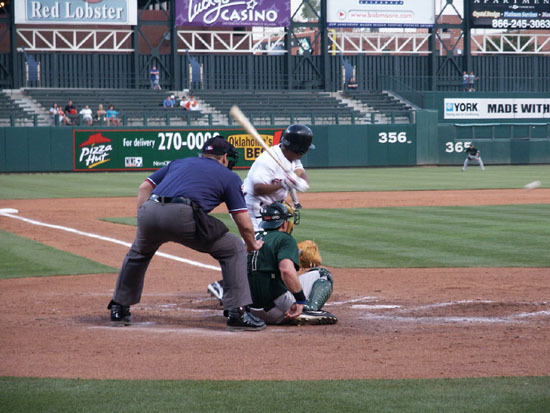 The RedHawks were playing the Edmonton Trappers and it did not look good for the RedHawks as the Trappers scored 4 runs in the first three innings. 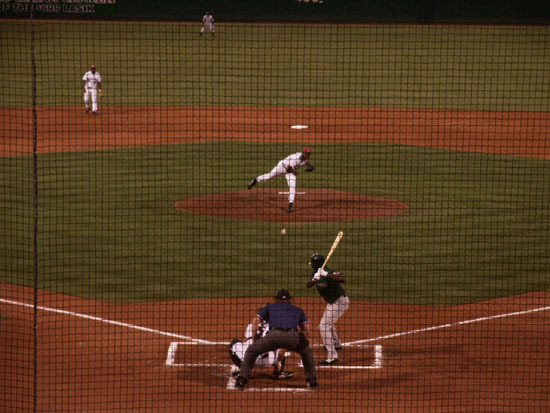 Then the RedHawks solved the Edmonton pitching and won 9-4. 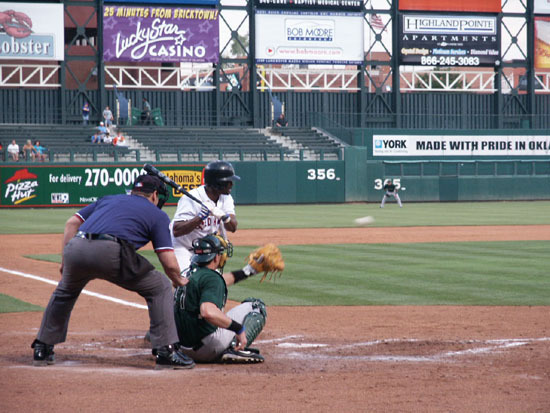 The box score was Trappers R-4, H-7, E-0 and Redhawks R-9, H-16, E-2. The field lines are RF-363', RC-405', CF-413', LC-365', and LF-325' A season ticket holder handed us an extra ticket as we were waiting to buy tickets, so we bought another one nearby and sat in the front row barely to the right of home. Oklahoma! 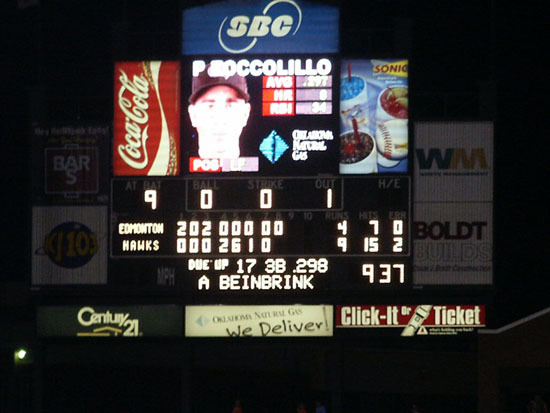 was sung at the bottom of the sixth inning. 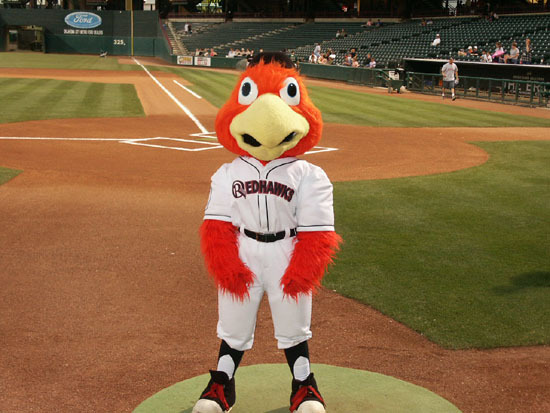 Rowdy, the RedHawk, is the mascot. 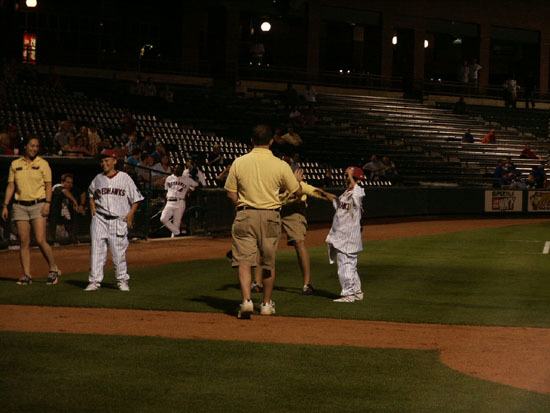 One of the between inning activities is to have two children dress in an adult team uniform and then throw a ball to one of the staff. 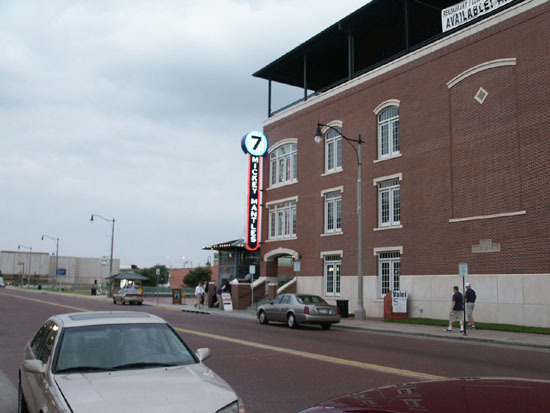 Across the street, Mickey Mantle St., is Mickey Mantle's #7 Restaurant. 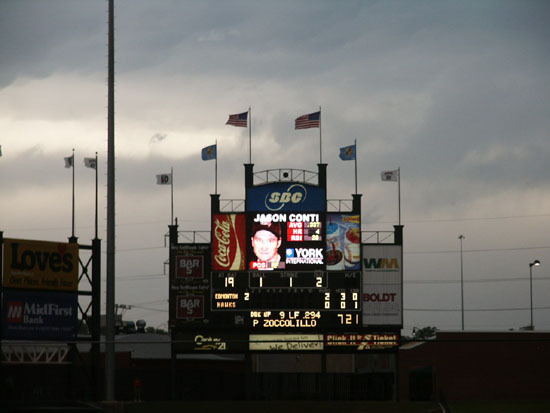 Jim talked to a fan who sells bats to minor league players early in the game. Toward the end of the game he sent Nancy Simmons, Asst. GM for Guest Services down to talk to us. We would like to thank her very much for the two nice t-shirts, hat for Jim, visor for Andrea, and league game ball that she gave us. 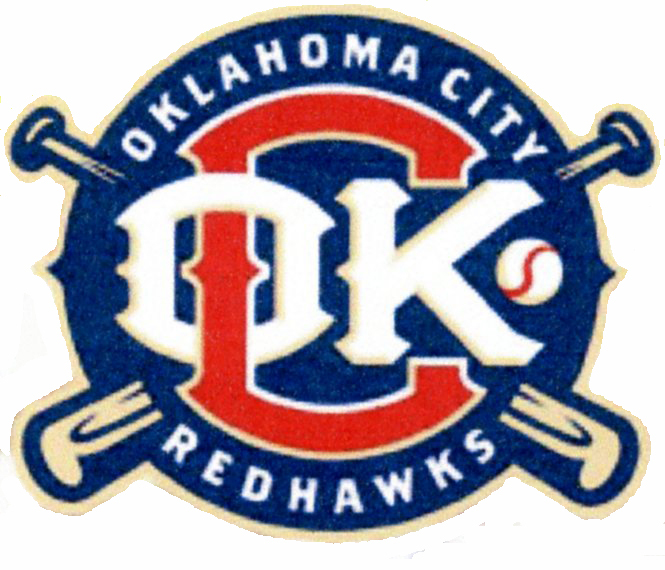 2010--New logo. 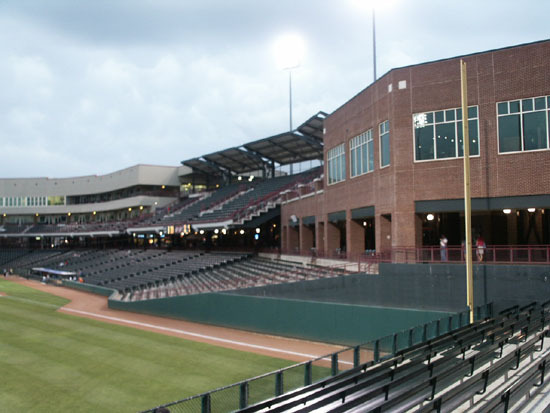 2014 Chickasaw Bricktown Ballpark. 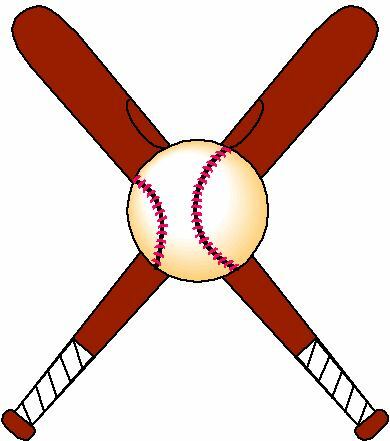 2015 New logo and affiliation change to Dodgers. National Cowboy and Western Heritage Museum - this 32-acre memorial to our Western pioneers has an extensive collection of art, historic artifacts and exhibits about American Indian and pioneer life in realistic settings. Fee. 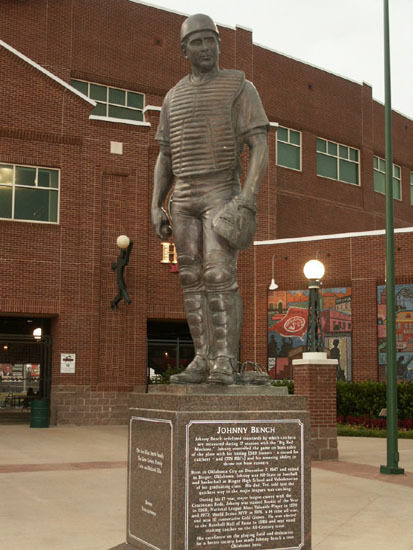 National Softball Hall of Fame and Museum presents the history and honors the greats of this popular amateur sport. Fee. Oklahoma City National Memorial was built in remembrance of the victims, survivors and rescuers of the Alfred P. Murrah Federal building bombing on April 19, 1995. Twin gates, marking the east and west entrances to the memorial, represent 9:01 and 9:03, the minutes before and after the tragedy.